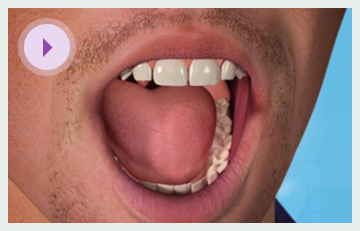 Dental amalgam fillings are made from a mixture of metals which set hard in the mouth. Dental amalgam has been the most common material used to fill cavitated teeth for over 150 years, and it is estimated that there are over 1 billion amalgam filling placed globally every year. The fillings themselves are silver in colour and will often appear darker over time. They benefit from being very strong and thus are suitable for teeth at the back of the mouth which undergo the greatest chewing forces. Here they will also be less visible than in the front teeth. Mercury is used to bind the other metals together. The material is very easy for dentists to manipulate and shape to fill cavities. In order to place an amalgam filling your dentist will remove the decayed area of your tooth and shape the cavity ready to be filled. A mixture of powdered metal alloy with liquid mercury will be processed in a chair-side device creating an easy-to-work-with amalgam putty. This is then placed in the cavity and shaped as necessary, before quickly hardening to a strong, durable filling. Those who have suffered from tooth decay are highly likely to have had their tooth restored to health by the use of an amalgam ('silver') filling. Dental amalgam has been a popular, effective and inexpensive material used by dentists for more than 150 years, but recently it has attracted growing publicity over possible adverse effects on health. Amalgam is made by combining mercury with particles of silver and tin, mixed with various amounts of copper and zinc to make it stronger and easier to handle. There is a huge range of filling materials available to dentists, each with their relative merits. An ideal one should be easy to use, inexpensive, tooth coloured, long lasting and without any adverse side effects. However such a material has yet to be developed. Dental amalgam is relatively inexpensive, easy to use and long lasting. In situations where aesthetics are not a primary issue (i.e. at the back of the mouth) amalgam is often the best filling material available as it is very hard wearing and is not very moisture sensitive. Chemical changes in the silver amalgam take place over a period of time that help to seal the filling at the edges, sealing bacteria out of the tooth. Other filling materials such as 'white fillings' made of ceramic or composite resin, are more expensive and do not seal in the same way. Leakage and durability can be more of a concern with some of these materials as they tend to be very moisture sensitive, meaning that once they become wet before setting fully there mechanical properties are compromised. Also these materials tend to take much more time to place. Although the individual components that comprise amalgam may be toxic in high enough amounts when they are combined they form a stable material that has some excellent properties. An analogy with salt is often used; both sodium and chlorine are harmful elements in their natural state, but when combined they form ordinary table salt. Those searching the internet for information on amalgam will find a great many claims linking it with all manner of ailments and diseases, including allergies, neuralgia, dementia and cancer. However there have been no scientifically sound studies which confirm the adverse effects of amalgam on the body. Amalgam fillings are not the only source of mercury we come into contact with on day-to-day basis; others include food, the environment and occupational exposure. Fish in particular often has a high mercury content. Icelanders are exposed to approximately ten times the level compared with residents of the UK because of the amount of fish they consume. Since mercury is a toxic substance in large doses, dentists and their staff must take particular precautions when handling and disposing of amalgam in order to protect the well-being of their patients, staff and themselves. Long gone are the days when amalgam used to be mixed in a mortar and pestle! It has been suggested that dental staff that use amalgam regularly are more at risk to the negative effects of mercury than patient are who are having amalgam fillings placed. It is rare for people to have an allergy to amalgam although it is possible. In these instances an alternative material should be used. Children have different requirements to adults, largely as milk teeth have shorter life-spans than adult teeth. Often children's teeth can be filled with tooth-coloured materials which are less durable than amalgam However, when a cavity is large and the restoration must be long lasting, amalgam is often the material of choice. There are a great number of factors which can dictate what is the most appropriate filling material to be used to fill a cavity. These will include the size of the filling, its location, aesthetic concerns and cost. If you have any concerns over what type of filling you require any of the dentists at Westdene will be happy to discuss the issue with you. The procedure will require the decay to be removed for your tooth, and taking out the metal or amalgam fillings if you are having them replaced.